Weddings are such beautiful events – even more so when they have that great rustic charm. Rustic weddings have gotten really popular over the past few years. It seems like everyone wants to add that rustic look to their upcoming nuptials so if that’s your dream wedding, you are certainly not alone. I love the rustic look and have used it myself in a few weddings that I’ve decorated over the years. If you are planning a wedding and you want your wedding or reception – or both – to have that rustic charm, I’ve found 35 beautiful decorations for you to DIY. Planning and decorating for a wedding is one of my favorite things to do. Weddings are filled with such love and hope that you just can’t help but get excited, right? Of course, I also get really excited when I find a new DIY project, so planning a DIY wedding may possible be my favorite thing in the world. Paper flowers always come to mind when planning a rustic wedding, and there’s a great tutorial for making paper flowers that will help you to fill your venue with beautiful flora. 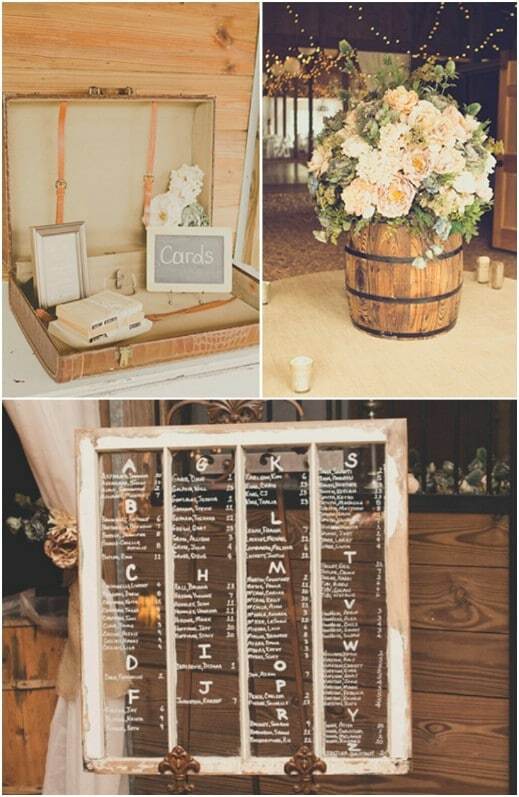 Whether you’re planning an indoor or outdoor wedding, there is a wonderful way for you to add some rustic beauty. 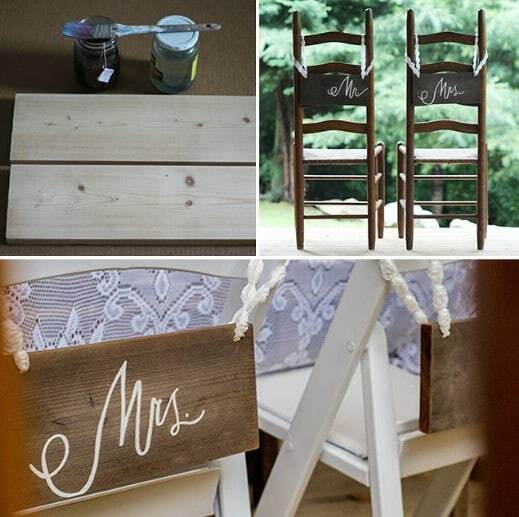 Whether your wedding is set to take place in a traditional church or an old barn – which by the way would be perfect for a rustic wedding – I’m sure you’re going to find something in this list that will help you to decorate, and these projects are really cheap and really easy to put together. Oh and if you happen to be getting married at home and want to dress up the yard for the event, be sure to check out these 20 charming mini water garden ideas. If you’re getting married soon, Congratulations! I wish you years of happiness and joy. 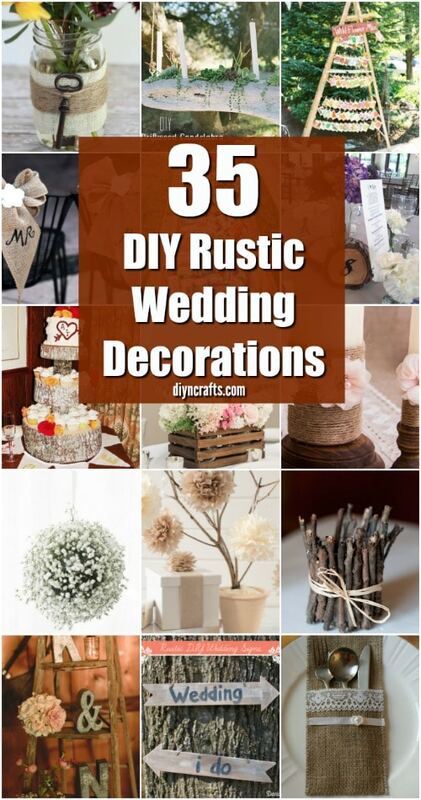 And, to start off right on your new adventure, be sure to take a look at these 35 breathtaking DIY rustic wedding decorations to decorate for the wedding of your dreams. 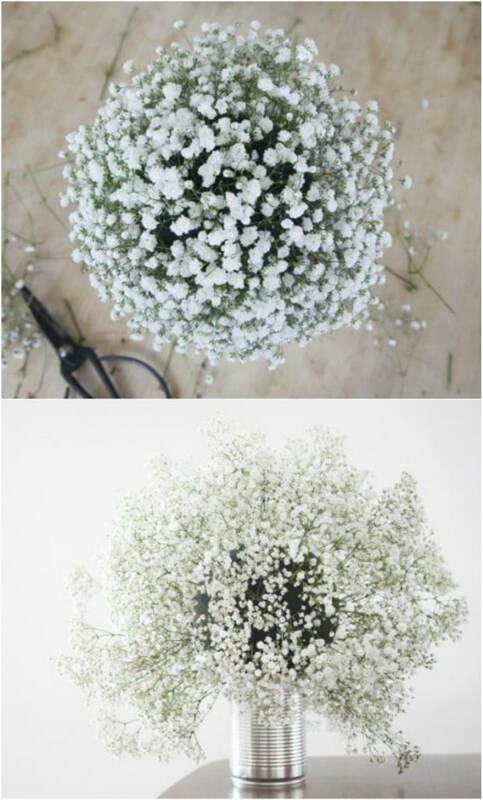 Baby’s breath really screams wedding and these DIY baby’s breath globes have such a wonderful rustic quality. They’re pretty easy to make, too, so they’re perfect for your rustic wedding. You can hang these throughout the wedding ceremony venue or the reception area. You just need foam globes, floral wire and fresh or silk baby’s breath. Burlap is really perfect for getting that rustic look and these burlap and lace chair decorations are perfect for any rustic wedding. You don’t even need to do a lot of work for these. 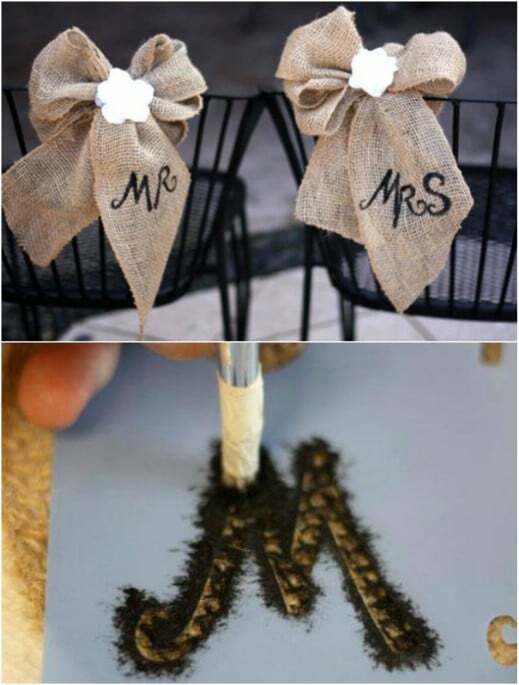 Just create huge burlap bows, tie them up with lace for the center and then add your Mr. and Mrs. They’re perfect for naming the chairs for your reception and are sure to add the perfect rustic touch to your wedding. 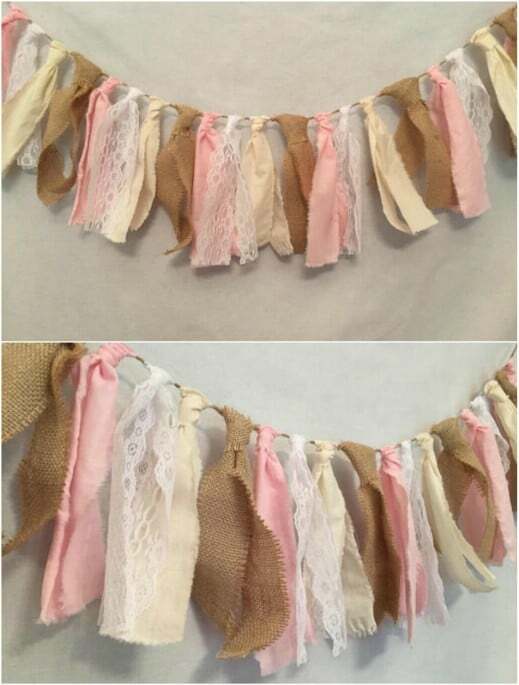 You can really add that rustic touch with a garland made out of burlap and lace. 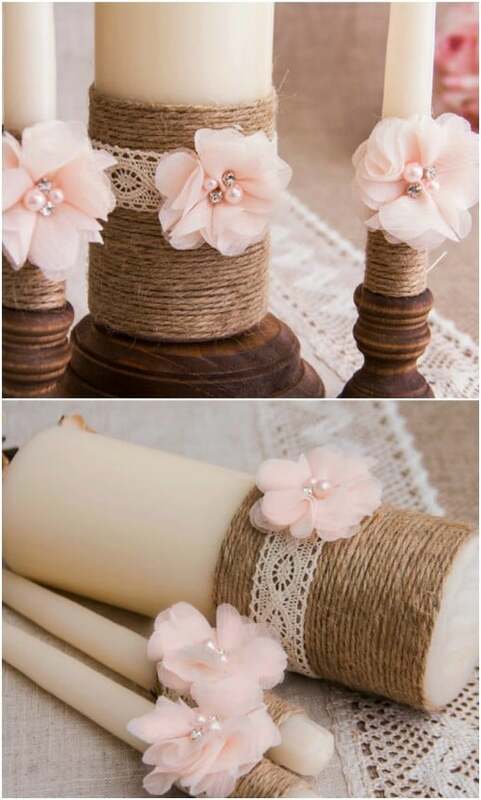 These would be relatively easy to make – just tie up strips of burlap and lace fabric onto twine and then hang them throughout your reception or wedding area. If you prefer not to have to do it yourself, I found this one on Etsy for under $25 and it’s three feet long – plus you have color choices for the fabric. 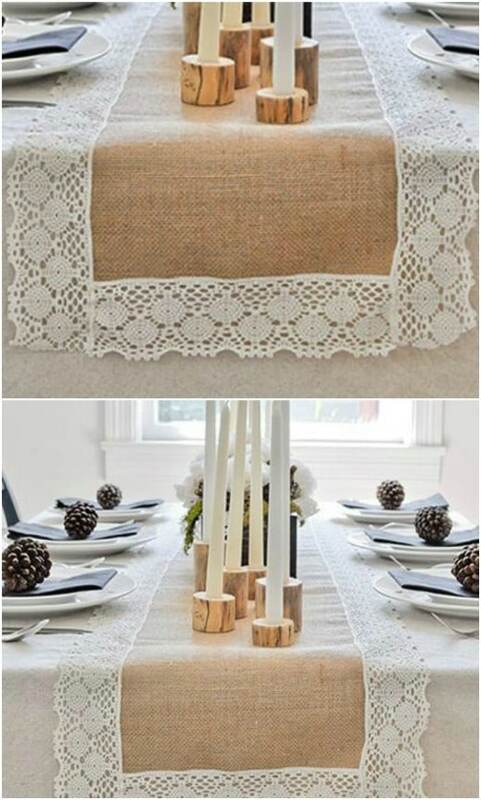 Whether your wedding reception is being held in a barn, outdoors, or in a traditional venue, you can add that rustic charm with this gorgeous burlap table runner. These are great for all sorts of occasions – I have one on my dining room table right now – and are perfect for adding a country touch to your wedding décor. Plus, they’re pretty easy to make and they really are beautiful, aren’t they? If you plan to light a unity candle at your rustic wedding, why not make it this lovely lace and twine candle? This one is on Etsy, and you actually get the large unity candle and the two smaller candles for under $35. You can’t find them at any department store for that price. You could make them yourself but if you’re not looking to completely DIY your wedding or you’re running out of time, these are perfect. time if you have to make several. You can start them ahead of time though and have plenty of time to have them on your reception tables on your big day. 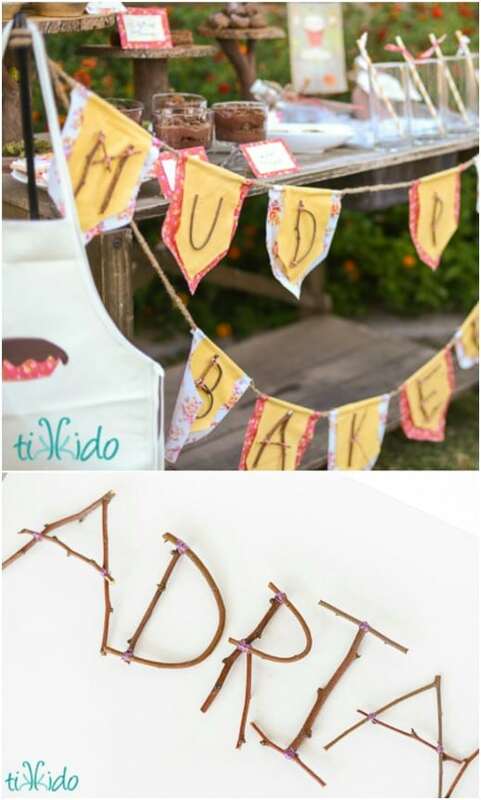 You can make these great rustic twig letters to use in any number of ways. I think they would look great on a banner announcing your reception but you could also make them into numbers for your tables or even arrange them to spell “love” to set off the mood for your special day. 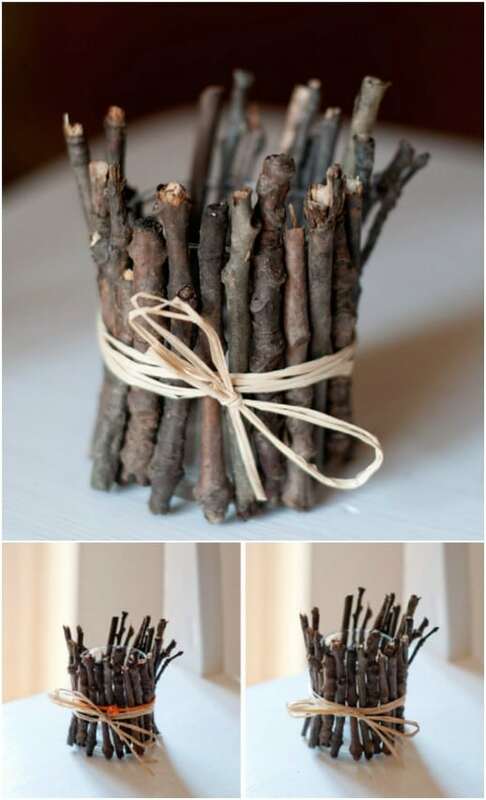 They’re pretty easy and as long as you can find twigs outside, these are completely free to make. This wooden flower box is perfect for holding cold drinks for an outdoor wedding reception. Not only does it look great – it’s wooden and it has a really nice rustic appeal. You could build the flower box yourself out of pallets if you don’t have one on hand – just a thought. 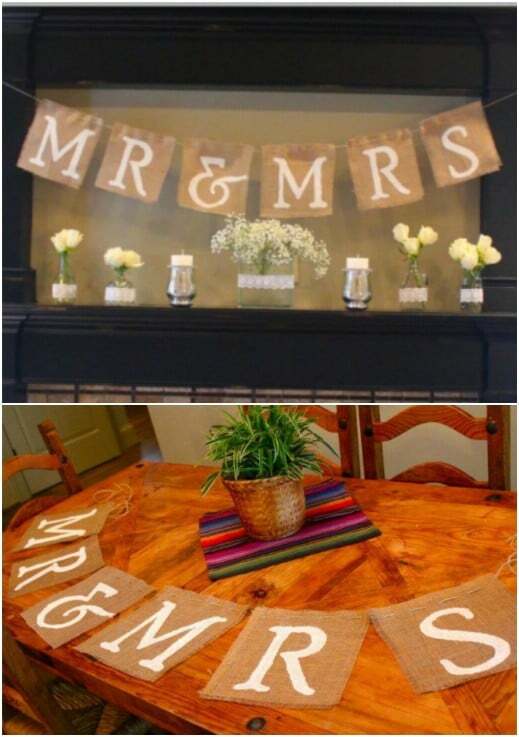 I love this Mr. and Mrs. banner that would be perfect to hang above the main table at your wedding reception. You could put it anywhere you wanted and it’s really easy to make. The burlap makes it perfect for rustic weddings and you can actually do the letters in any color you need to match the wedding décor. You just cut squares of burlap and then stencil in the letters. 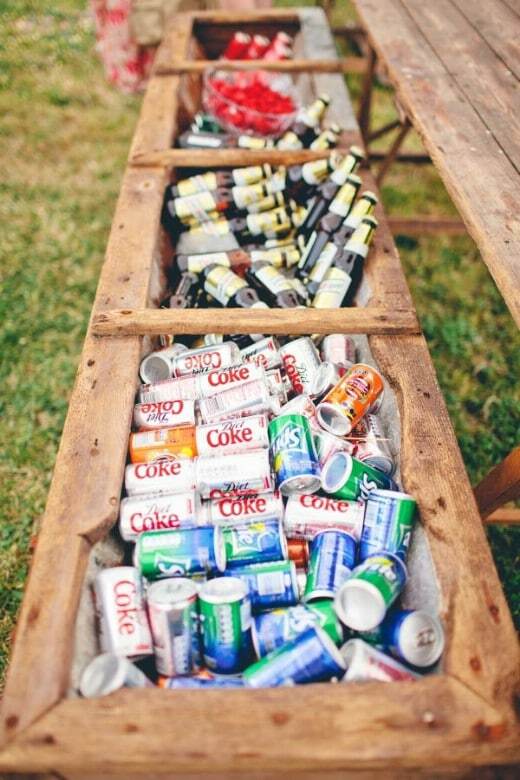 Pallets are certainly going to give your wedding a nice rustic touch. I love this pallet collage idea. You can add pictures of you and your soon to be spouse from throughout your relationship and hang them on an old pallet. You can find pallets at many stores or lumber yards and they’re pretty cheap – some places will even let you have them, especially if you tell them they’re for your wedding. Mason jars just scream rustic décor, don’t they? These mason jar hanging vases are perfect for rustic wedding decorating and they’re very easy to make. You just choose however many jars you need, add lace or burlap and then your flowers of choice. Tie a piece of twine to the top of each of your jars and you have the perfect aisle decoration. 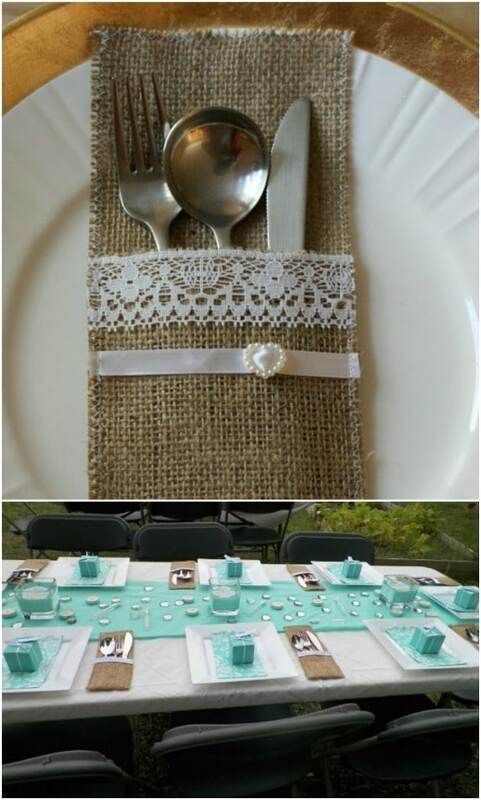 You can also use these as table decorations at your reception. 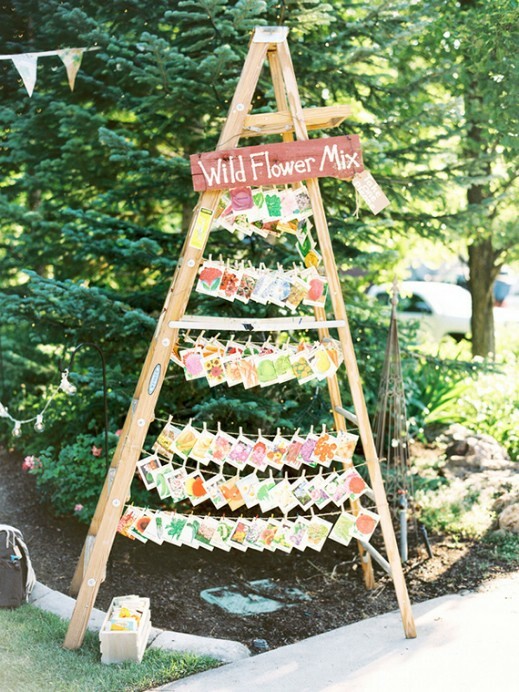 Not only does this little wish tree add a rustic touch to your wedding or reception, it also gives your guests the opportunity to give the gift that keeps on giving – cash. I’ve been to several weddings over the years that have a wish tree and this one is really adorable. 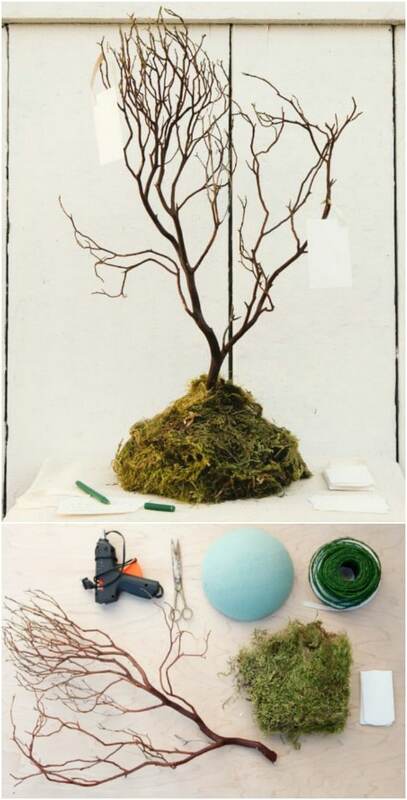 The tree itself is really easy to make and when it’s finished, you just leave little note cards and envelopes for guests to offer their warm wishes. Many of them will also offer a cash gift to go along with their kind words. You need a centerpiece for the reception, right? Or a decoration for the actual wedding…which is where this lovely driftwood candelabra comes in. It adds the perfect rustic touch and would even work really well for beach themed weddings. Decorated with succulents and taper candles, this just might be the most beautiful decoration at your wedding and when the ceremony is over, you can take it home and display it for years to come. Sometimes the simplest things can make the grandest of statements. Take this mason jar vase for example. The addition of an old skeleton key gives it a lovely rustic look. You can buy skeleton keys at most craft and hobby stores and then vase itself is very easy to put together. 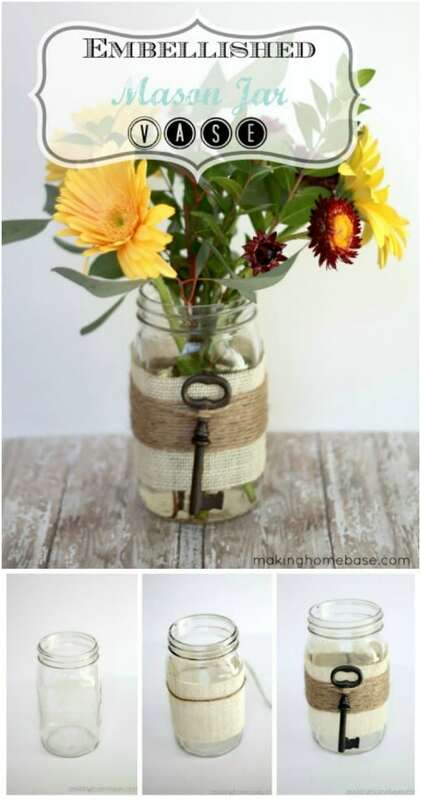 Just add burlap and lace to a mason jar, tie on the key with twine and then add your flowers. This is perfect for adorning those wedding reception tables. This flower chandelier not only gives your wedding a rustic touch, it gives it an elegant and beautiful one as well. 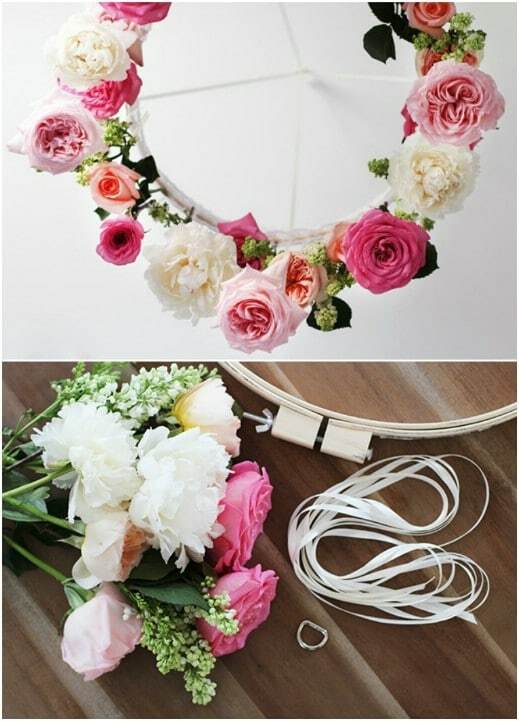 This is so easy to make and would be perfect for the wedding ceremony or the reception. You can use fresh flowers if that’s what you’re using in the wedding or make them with silk flowers if you want them to last for a while after the big day. You’ve probably seen this great hula hoop chandelier project at some point. I think it would be perfect for rustic weddings, especially if you are planning the ceremony or the reception after dark. 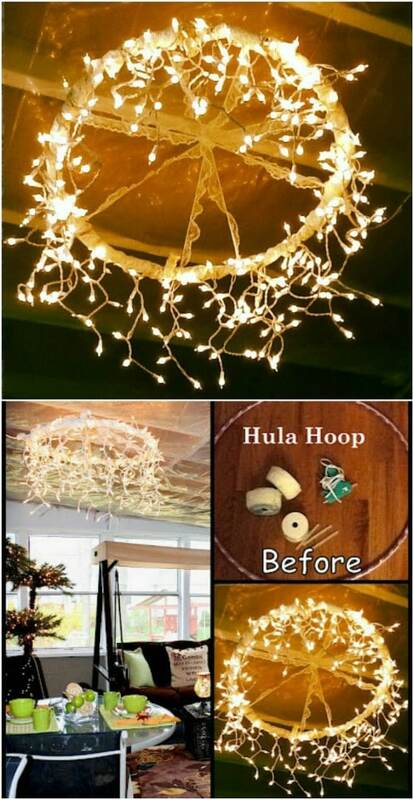 It’s really easy to make with a hula hoop – which you can get at the Dollar Store for a dollar – and some clear Christmas lights. You could even add silk flowers if you really wanted to dress it up or hang some burlap bows from it to make it even more rustic looking. Mason jars really are great for rustic wedding décor. You can do so many things with them. Just take a look at this LED mason jar light. 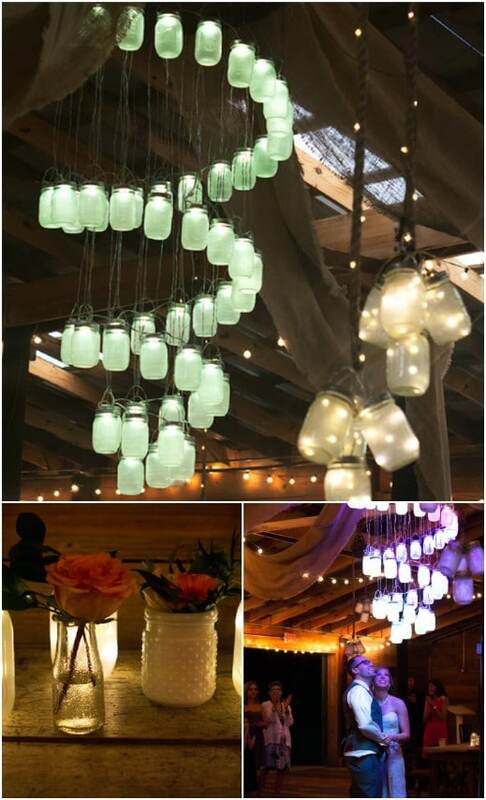 Take a few empty mason jars and fill them with cheap LED lights that you can get at the Dollar Store and you’ve got a gorgeous display for your wedding or reception. You can even paint the jars first to give them a nice frosted look. If you have the opportunity, I would totally suggest making this rustic sign for your wedding. No matter where your ceremony or reception is taking place, this sign is perfect for adding that country touch and it’s really easy to make. You can also put on whatever message you want to make it more customized and even have a few of these pointing your guests in the right direction for all of the festivities. You can make your wedding as rustic as you want it to be, right down to the wedding cake topper. Cake toppers can be very expensive depending on what you want adorning that triple tier cake, but these birch wood toppers are anything but expensive and they’re really great for adding that custom touch. I found this great personalized one on Etsy, and it’s less than $30. Nothing says rustic décor like a few distressed wooden candleholders. You can buy Cape Cod designed candleholders at Pottery Barn or make them yourself for just a fraction of that cost. Head to your local thrift store and look for candleholders, which you can then turn into these amazing distressed pillars that would be perfect for decorating your wedding ceremony or reception. This amazing crate can be made with a few really inexpensive paint sticks. Once you have it made, you can fill it with loads of flowers and decorate your reception tables. The crate itself is really simple to put together. Then you just choose your flowers and maybe even add in a few long taper candles if you want. 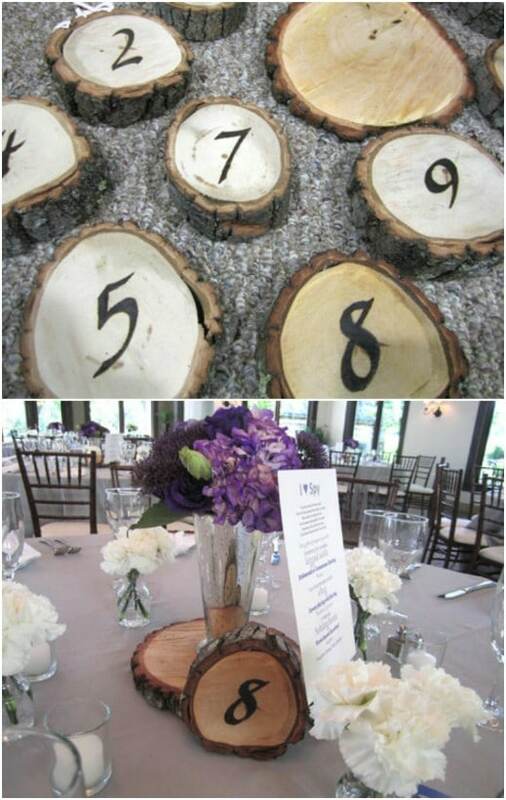 I love these rustic table numbers, which are perfect for your reception tables. 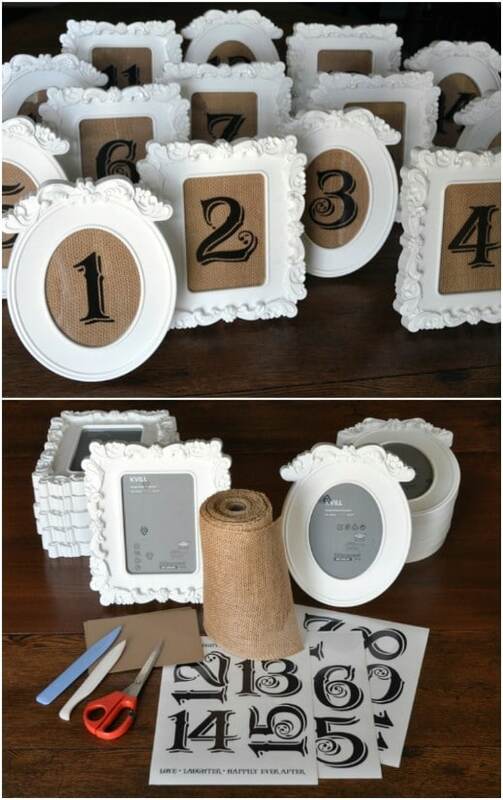 The numbers are attached to burlap which is then framed in adorable white frames. You could do any color that you want and even distress the frames a bit if you want an extra touch of rustic. This entire thing is just beautiful and takes very little time to put together. And, it’s pretty inexpensive considering you can buy the frames at the Dollar Tree for just a dollar each. Wooden circles as wedding cake stands have become very popular. This DIY rustic cake stand uses a wooden circle that has been glued on a small log of wood. The entire look is absolutely gorgeous and it would be perfect for smaller cakes, cupcakes or even to hold your actual wedding cake, provided you choose a strong enough log. I love the idea of incorporating wood throughout a wedding to give it a really nice rustic touch. I love this tiered cupcake stand that is made from wood rounds and small pieces of log. You just cut the rounds to the size that you need and then drill and screw the log pieces into place. 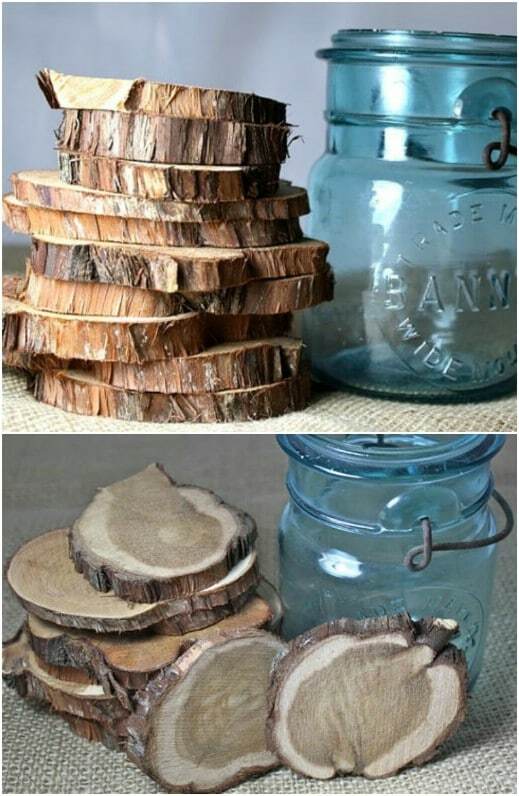 This is so simple and not very time-consuming once you have all of your wood pieces together. When it’s finished, use it to display cupcakes and turn your entire reception into a rustic wonderland. Let your ring bearer add to the rustic charm when he carries the rings in this gorgeous tiny stump! 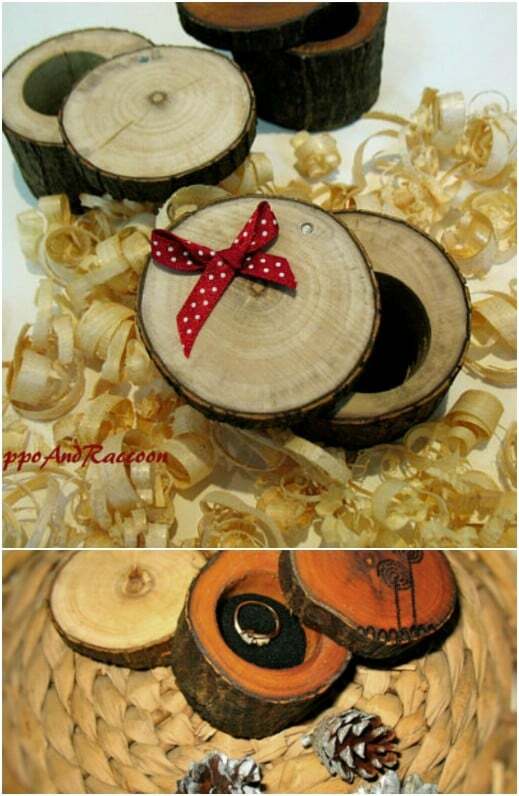 It’s a stump that has been turned into a ring holder and it really adds rustic appeal to your wedding ceremony. I found this one on Etsy. It’s made from acacia wood and you can have it personalized if you want. 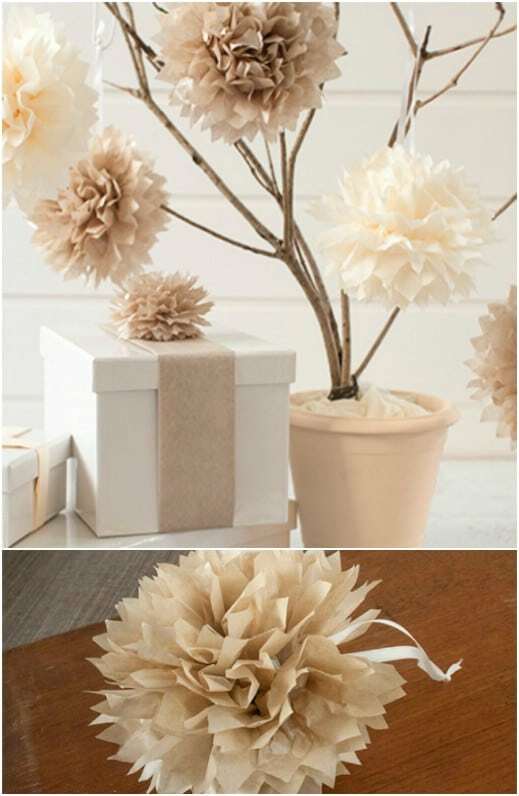 These tissue paper pom pom flowers are sure to add rustic charm to your wedding ceremony or reception. They’re really easy to make and tissue paper is so inexpensive. You can pick up a pack that has several pieces from the Dollar Tree or Dollar Store for a dollar. You’ll only need a few packs in whatever colors you choose to make an entire bouquet of these lovely flowers. I have to say, I love the idea of giving out wildflower seeds as wedding favors to guests as they leave. I love it even more considering those wildflower seeds could be hung across an old ladder with twine, just adding to the rustic beauty of your wedding and reception. Depending on where you are getting married, you might even be able to use wildflower seeds instead of rice or birdseed as your send off. Either way, when you string them up on an old ladder, it looks gorgeous. Wooden circles are perfect for dressing up your rustic wedding reception. You can place these on tables to hold your mason jar vases or use them in any number of other ways from cake displays to just about anything you want. You can get 10 wooden circles cut from cedar wood – which smells amazing – on Etsy for just over $10. 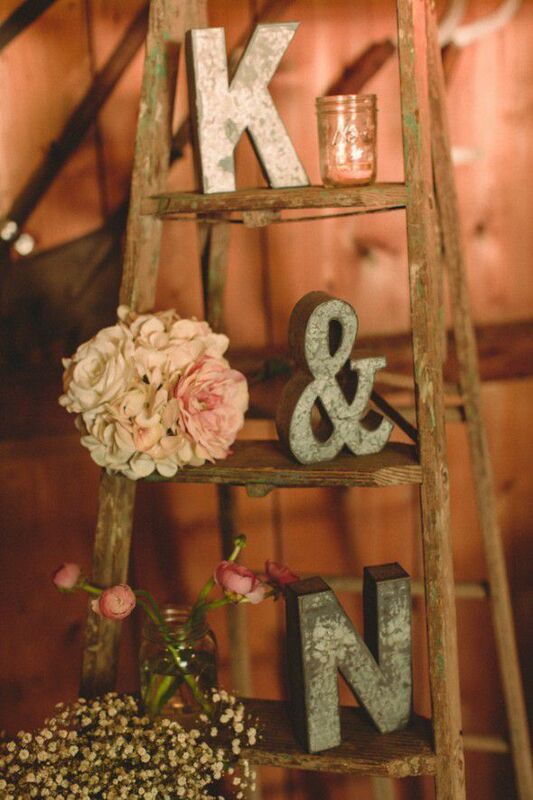 Here’s another great way to use a wooden ladder in your rustic wedding decorating. Just put the ladder wherever you want to display it, and then add decorations. I love the use of the wooden letters or you could do pictures or just about anything you wanted. Fill it with mason jars that hold flowers or candles. The possibilities are endless! 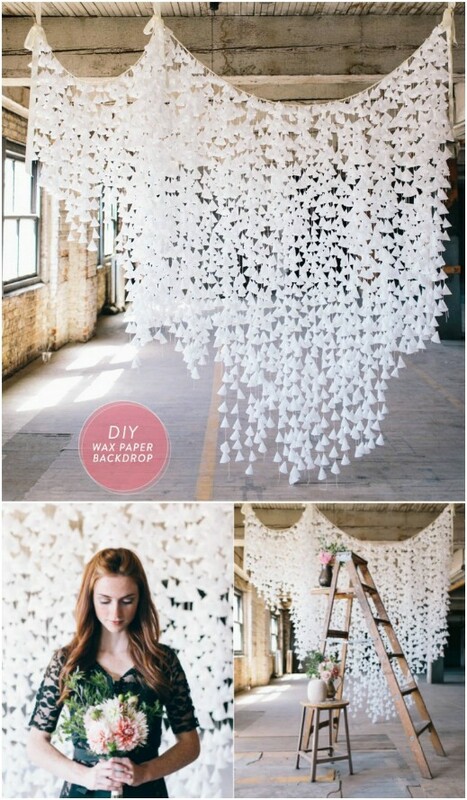 If you need a backdrop for the wedding ceremony, this wax paper backdrop is gorgeous and adds a very nice rustic touch. It’s very intricate and takes a little time to put together but it is so worth the effort. You can have your wedding party help to make it and once it’s done, use it behind you for the ceremony or even as a photo backdrop for pictures afterwards. Many guests bring cards to the happy couple for the wedding. If you’re planning to have a wedding card box and you want it to coincide with your rustic décor, this log box is perfect. 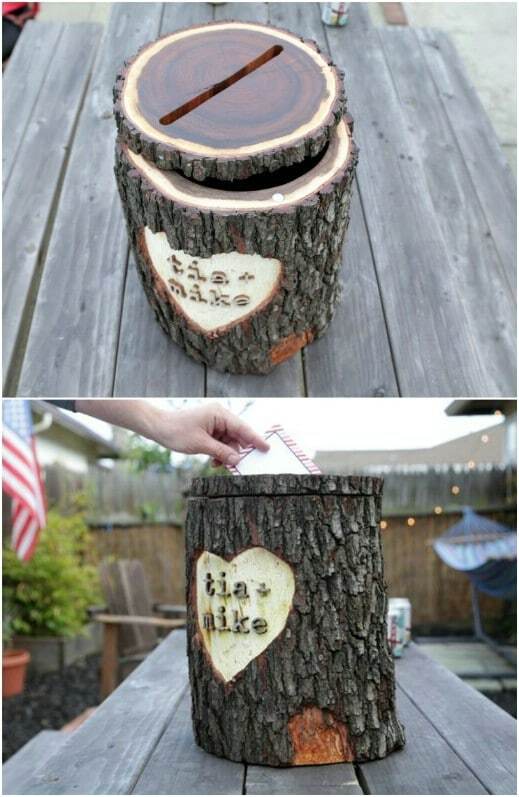 You can carve your initials in it and guests will adore dropping their cards inside. This is a pretty easy project and won’t take you long at all to finish. It will add the perfect touch to your rustic wedding décor. What says rustic wedding more than wine barrels? Well, not full of wine mind you, but turned into these gorgeous flower holders. 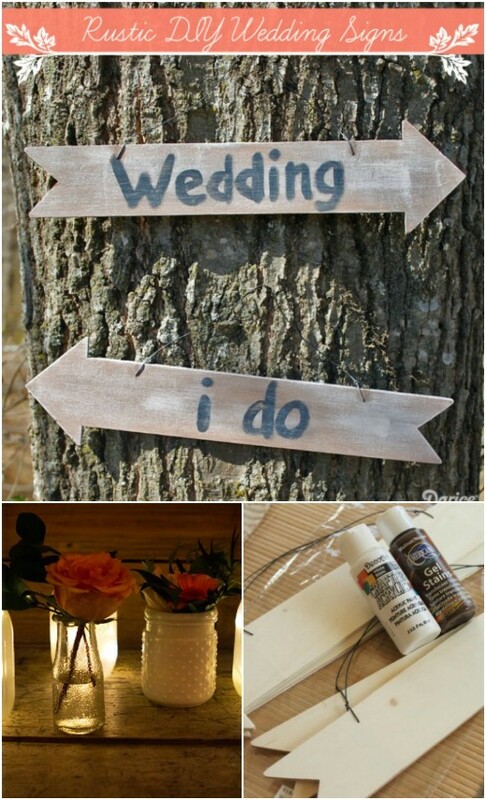 This is one of my favorite DIY rustic wedding projects and one that I plan to use in the future. You just get ahold of a few wine barrels and use them to display beautiful flowers to decorate your wedding ceremony or reception. You can find smaller barrels at hobby or craft stores and use them to decorate your reception tables. You’re planning to have a guest signing book, right? 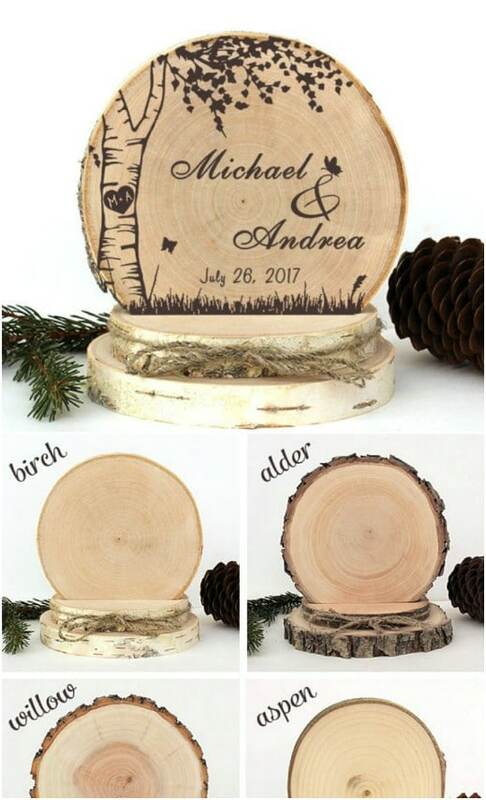 Well, why not make it this gorgeous wooden one that perfectly complements your rustic wedding décor? It’s a long slab of wood and guests can sign right on the wood. Plus, I found this one on Etsy and you can get it personalized with your name and the date of your wedding. 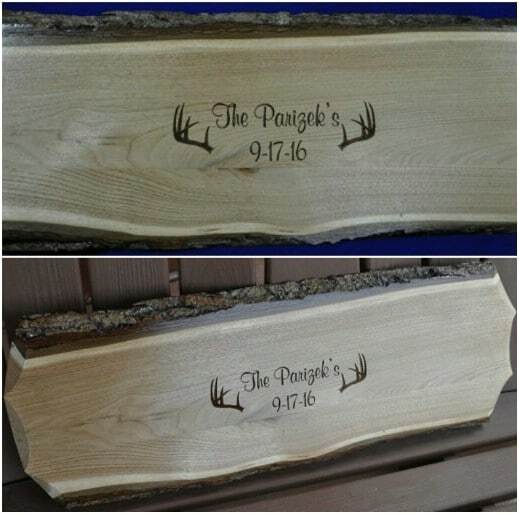 It’s a great rustic guest registry and one that you can hang in your home after your nuptials. Here is another wonderful way to dress up your reception tables with some rustic charm and a great way to use some wooden circles. You can cut slivers of wood from a tree – make sure that you have permission first – and then use those to display the numbers of your tables. Use a Cricut machine to make stencils for the numbers or you can buy the stencils at any number of hobby stores. The Dollar Store may even have them really cheap. Then, use a permanent market to outline the numbers and you’re all done. Weddings can be expensive. If you have ever planned one then you know that decorations can get a bit costly. Well, not when you do them yourself. 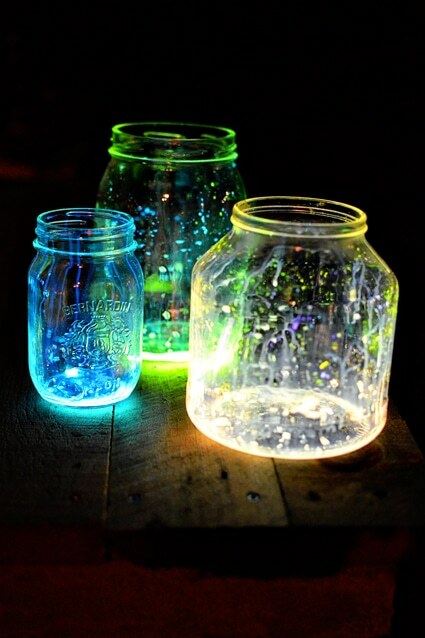 These beautiful glow jars would be a lovely addition to any wedding or wedding reception and they cost less than 20 cents each. 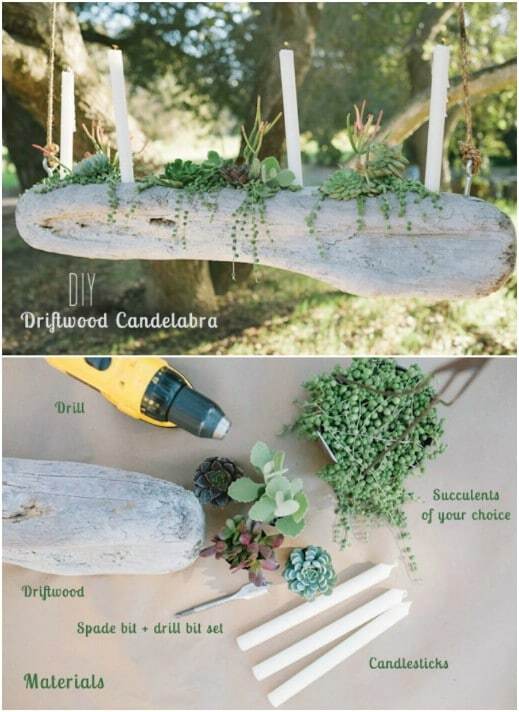 Now that’s really a DIY project that is perfect for any occasion. Not planning a wedding? Just make them to sit outdoors during the warmer months. They are cheap, easy to make and beautiful. What more do you want in a DIY project? Thanks to Intimate Weddings for the DIY tip.